This is my now final review of the Sony SEL2470z. Keep in mind that I do lots of landscape photography so I emphasize certain aspects others won’t find as important and vice versa. This is the fourth lens released for the Sony FE-System. In theory it should be good for many applications like reportage or travel photography. In this review I will try to assess how well it performs. This lens has a good build quality, but it doesn’t feel as rugged as Carl Zeiss Lenses from the A-mount series. I think the outer barrel is made from metal, as is is the filter thread, but I am not 100% certain here, might be high quality plastics as well. Zoom- and focus-ring operate smoothly but I would have liked some more resistance on the focus-ring. The lens hood is rather heavy and has a nice feel to it, it also locks in quite steadily and needs a healthy amount of force to remove it. I use a a7, so results might be different for the A7r. AF speed is good but not on the same level as good DSLR lenses. In a bright environment the speed is quite good as is the precision. In a darker environment like a normally lit room (f/4, 1/50 Sek., ISO 3200) the AF is slower but still usable for people photography. The focusing ring isn’t too well damped and I find its operation quite silly. 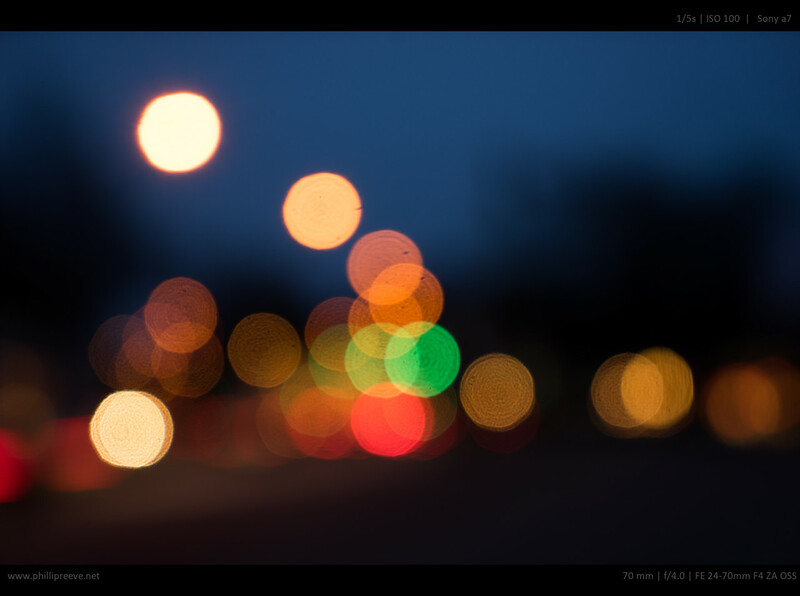 If you turn it fast you can change focus from 40cm to infinty by turning the focusing ring less than 30°. If you turn it slowly you can change focus from 40cm to 50cm in 90°. I could focus it precisely but I didn’t like the experience and would have preferred an speed independent implementation. 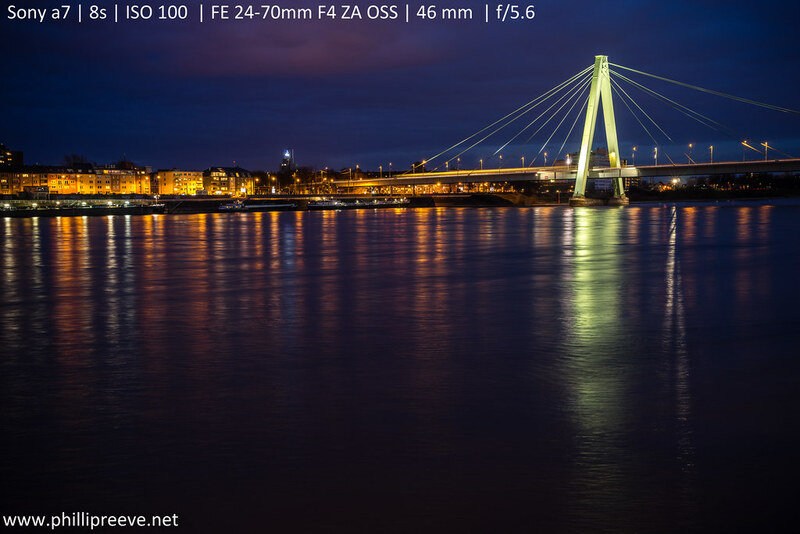 I tested the OSS at 50mm and found that it made a difference of about 2 stops. While I got consistently sharp images at 1/25 sec. 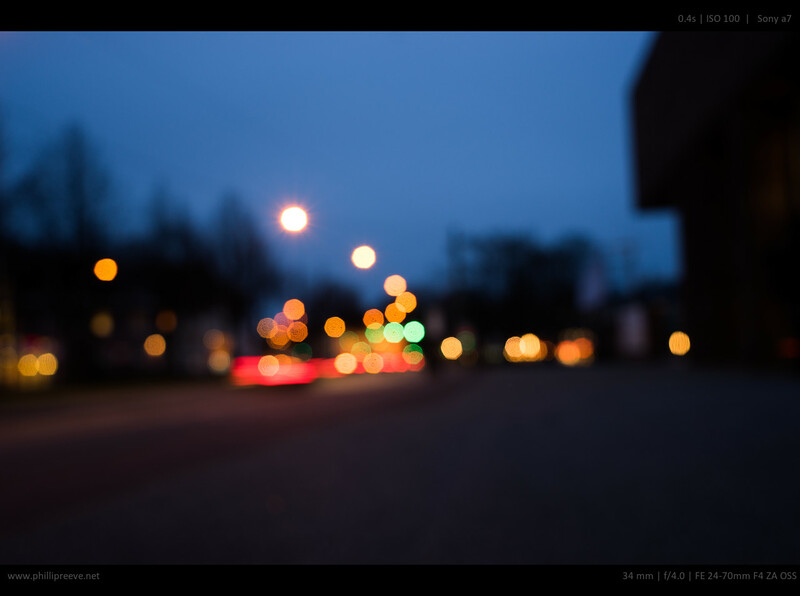 without OSS I would get sharp images at 1/6 with OSS activated. 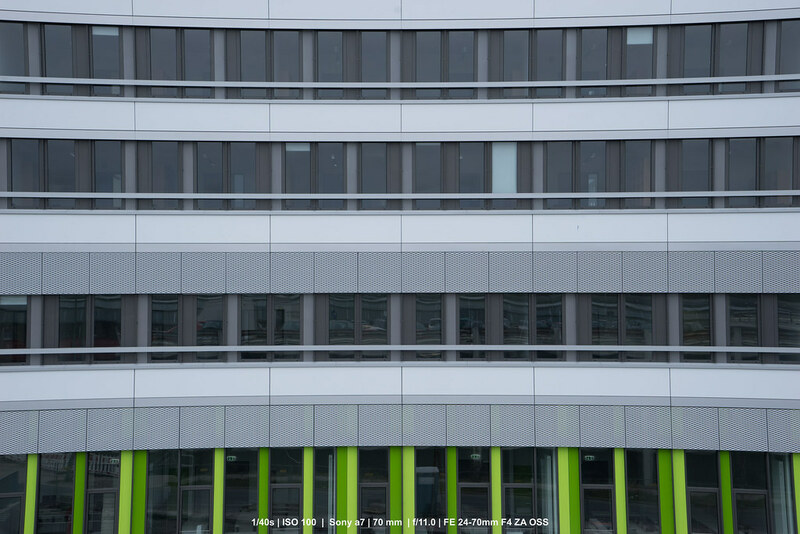 This lens shows significant distortion, not as bad as that you have to correct it in any case but it is easily noticeable as soon as there are straight lines in the image. The Distortion changes around 32mm from barrel to pincushion. If you shoot JPG the image is automatically corrected and you won’t see any distortion. It is not possible to deactivate distortion correction. It is also interesting to note, that the lens has a wider field of view than e.g. 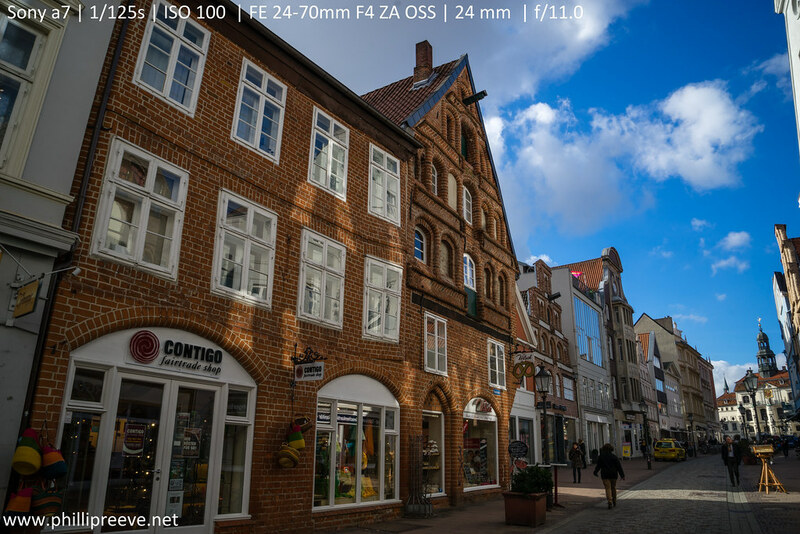 the Zeiss 2/24, I think the reason for that is that distortion correction will lead to a slight crop of the image, so the corrected image will have the same field of view. What I also noticed was that even at f/4 the highlight discs aren’t perfectly circular. 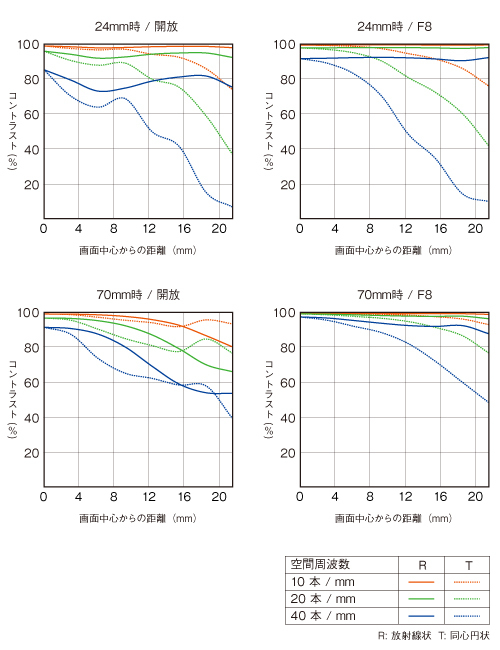 These are from Sony and they are calculated with some rather questionable assumptions, so they are in no way comparable to MTF-charts from Zeiss or Leica. But they can be useful to compare this lens against other lenses from Sony and they show massive astigmatism at 24mm. Most of the frame is super sharp and contrasty from f/4 with surprisingly little change as the lens is stopped down. The corners and parts of the edges are rather lousy and stay lousy from f/4 to f/11. Sagittal structured are much sharper than tangential ones, so the lens shows astigmatism. Most of the frame shows good sharpness and great contrast from f/4. The corners are okayish at f/4, improve quite a bit at f/5.6 and become quite good at f/8. thats a pretty good performance! The Image is quite sharp from corner to corner even at f/4, the corners aren’t as sharp as the center but the falloff is low. At f/4 the whole image is somewhat softer. At f/5.6 most of the image is sharp with okayish corners. At f/8 the corners improve a little, but they aren’t great. I used AF and OSS, so take the results with a grain of salt, but they are in line with my previous more vigorous testing. I think there are two ways to look at this lens: From the perspective of a people/reportage photographer it is a good lens. About 70-90% of the image is sharp from f/4 and the center is super sharp. Only above 65mm it is necessary to stop down to f/5.6 for really good central sharpness. The lens covers a super handy focal range, combined with the camera my setup is significantly smaller than a comparable FF DSLR, and OSS is also handy. From about 30mm to 60mm the performance is quite good, most of the image is super sharp from f/4 and the corners are sharp stopped down. The corners aren’t as sharp as those of some of my better primes but they are good enough in my eyes. The corners at around 24mm are lousy. Period. I don’t mind if corners aren’t sharp at f/4 as I am shooting at f/8 or f/11 anyway, but they never get sharp. Performance at 70mm isn’t to great either, at f/4 the images are somewhat soft, sharp enough for web images but not for bigger enlargements. 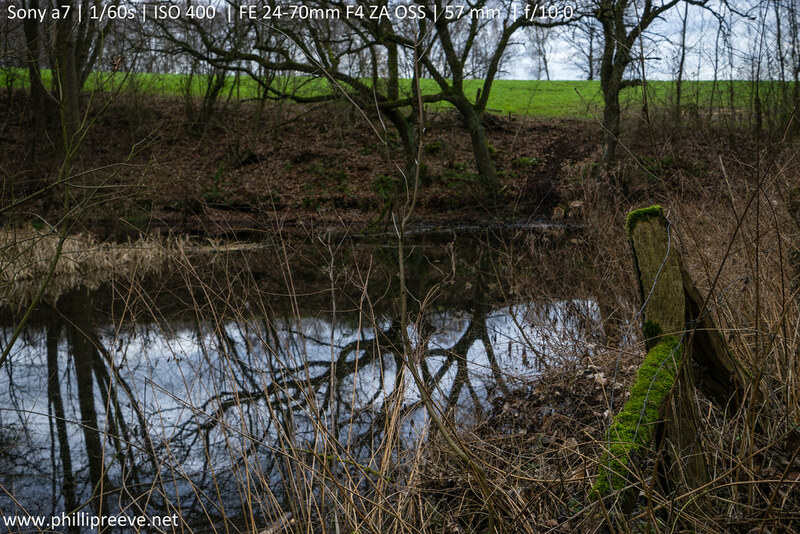 Central sharpness is good from f/5.6, but even stopped down it won’t be sharp from corner to corner. Most standard zooms from others manufacturers aren’t any better but many are cheaper and I think this lens is overpriced by several hundred euros because it doesn’t deliver better image quality than much cheaper lenses like the Canon 24-105 or Nikon 24-85. In the end I sold my copy because I would have had to trade too much image quality and cash for the convenience of this lens. If you liked my reporting on this lens and consider buying it (or anything else), please use one of these links, so I can earn a small commission on your purchase without any additional cost for you. You can find all the test images I took in full resolution in this flickr set. You can also see the following images in full resolution on flickr by clicking on them. These are processed images. If you own a a7/a7r/a7s you really should at least try a manual lens, many offer much better across the frame sharpness than the FE 4/24-70 and they are a lot of fun to use. 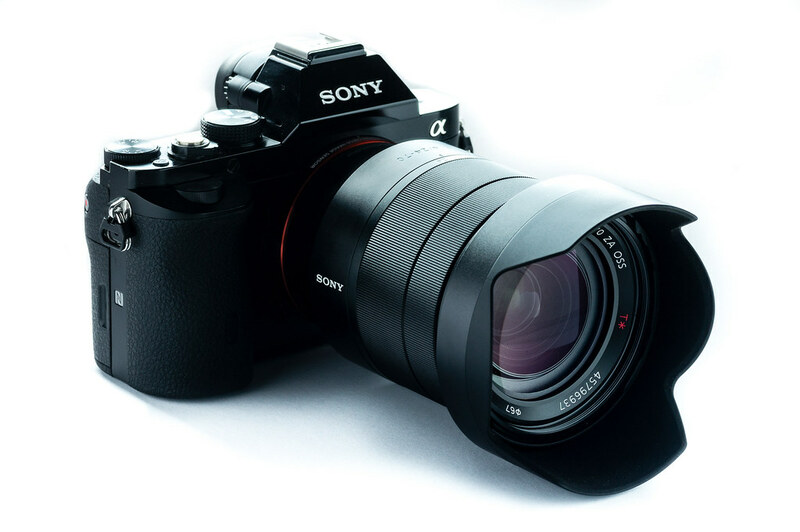 Check out my MANUAL LENSES ON THE SONY A7 – A BEGINNERS GUIDE. Excellent review – thanks for spending the time to publish. I will buy this lens as a general walkaround, and just avoid 24-28 and 60+ for landscapes where corner and edge performance are needed. It’ll make a pretty decent travel zoom, especially with OSS. It’s certainly no replacement my exisiting zeiss primes and zooms though. Try focusing near the edges, it likely has field curvature and that might help flatten it out. Great job with the samples. Could part of the blur in the corners at the ends not be a result of correcting the rather pronounced distortion shown in the first image – did you try and look at uncorrected shots? all the test images are uncorrected, some of the sample images are corrected. All show similar corner performance. Hello, thanks for the test, what interests me most is how it compares to the kit zoom. The weight is important, so I’d be really interested to know if the quality is worth the price and weight. Thank you ! Exactly what are the “questionable assumptions” of the calculated MTF charts? The numbers in the charts seem to demonstrate exactly what your tests images are showing. according to the charts this lens should be super terrific at 70mm and it certainly is not. For example they don’t take diffraction into account and I think they are calculated for monochromatic light as well. Well…all I’m really seeing is sample variation issues. Please link to some sharper 70mm shots. Have you paid attention to the left coners at 70mm? 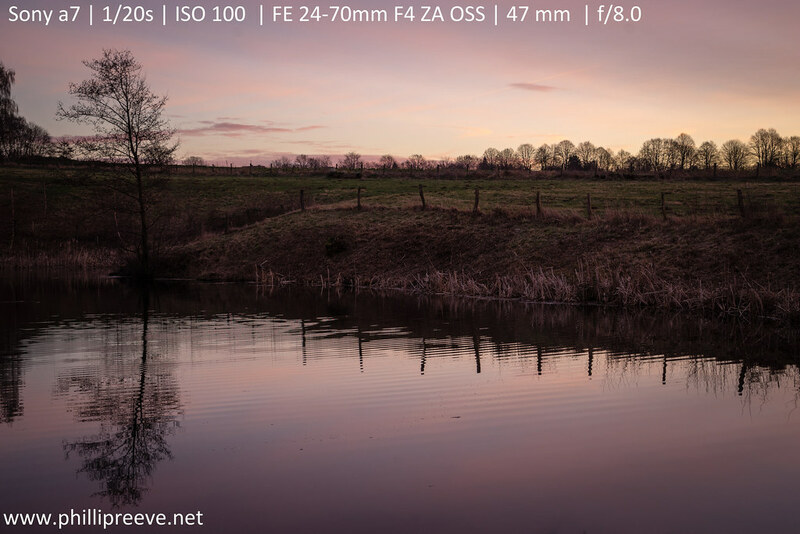 My 2470z with A7r gave really bad results for FL=70mm (no problem for FL<=60mm). It is weird that the vertical lines on the left edge splitted into two: one solid and one faint, for the apertures F5.6 and F8. But those ghost lines disappeared at F4, F11 and F16. I contacted Sony China and they said it was normal. I only wish the problem is with my copy of the lens rather than a general issue. Do you use the OSS? I have noticed a far worse image quality when you use tripod and OSS, exactly that kind of ghost double details you describe, especially in the corners. So, when on tripod, turn off OSS. Hi Phillip – Love your images with it at the end. Goes to show even if the lens is showing some less than promising performance results under testing, a talented photographer will still make compelling images with it. Regarding the unevenly shaped defocused specular light disks: I wonder if the lens has a secondary diaphragm, perhaps to maintain the lens’s constant aperture value or act as an internal baffle? I noticed this with my Canon 16-35, where the secondary diaphragm is well back of the aperture (between it and the rear of the lens) and changes size as the lens is zoomed. When the lens is at the ‘long’ end, the secondary diaphragm disappears from view. Conversely, it’s most evident at the wide end. Perhaps worth trying your test again at other focal lengths to see if the shape of the light disks changes or improves? when I am at f/4 and zoom in and out I see the aperture closing as I zoom out, but you can always see the aperture blades. So yeah, the aperture is closed to keep the aperture value constant. But I can’t see a secondary aperture. My guess is, that the “bad edges” are a result of field curvature and this is usually not an issue of sample variation. Hey Roger, testing only one copy is always a problem, but so far I haven’t seen any better examples showing better performance at 24mm or 70mm. Those samples you linked to are only 2000px wide, I find it hard to judge image quality from that resolution. I think that it would be nice to see the same tests performed on the A7r, as I believe that this lens was primarily designed for that sensor, where the 28-70mm kit lens was designed around the A7 sensor. It would be interesting to see the differences anyway, as the 2 sensors do have a different micro-lense design witch would effect corner performance. I would be surprised a lot if that was the case. So far I have not seen a single comparison were the A7r showed better performance on a lens which didn’t perform well on the A7. I know a few people have asked this in more specific ways, but would you be able to compare this with the 28-70 in general? Maybe I missed it, but I imagine a lot of people want to know if the 24-70 is worth the cost compared to the 28-70. I’ve not been able to find comparisons yet, myself. I’m hearing a lot of comments around the 24-70 being pricey for what it gives. Of course all of this is dealing with the test copy of the FE 24-70. It will be very interesting to see what the real deal is like. money matters: Buy only the body and after registradition on the Sony website you get an email offering the Vario-Tessar with a 30%-bonus. If I had expected this, I could have spared 360.- €. well, you pay 250€ more if you buy the a7 at Sony than at Amazon but it is still a good deal. Thanks for the report! Aren’t those non-circular highlights an indication of a defective lens? At least I don’t know of any other lens that would give you such strange and ugly shapes at open aperture even discounting the rather strong onion business. The whole sensor reflection issue is really a tragedy btw. Your cityscape shot shows lamp posts shooing violet and green rays of death… and that’s with a native lens that should be coated accordingly. Too hard to fix in post. As always, thanks for your excellent work. oh not, they are not. If you look through the lens from the front you see that the aperture is always closed a bit, even at f/4, therefore you can see the shape of it in the shape of the blur circles. 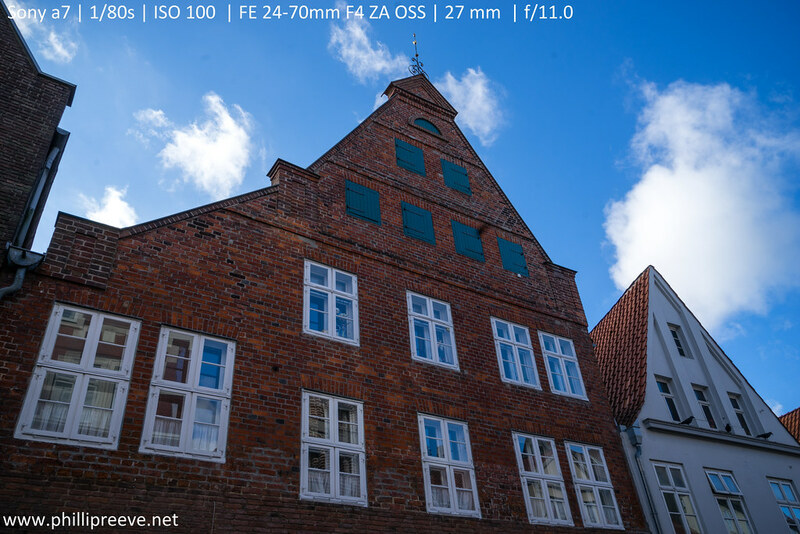 I suggest checking the left corner of every image because I had the same behavior with my FE 35 2.8 and it was an asymmertry problem: right border/corners were always lousy until f11, left ones really sharp from f 2.8. I’ll wait for yor response. they aren’t any better, sorry. Your sample photos are gorgeous colour and contrast. Thanks for the intensive testing, Phillip! I was a bit astonished to read, that you use f/11 very often. I remember Lloyd Chamber on the Nikon D800, that below f/5.6 diffraction starts to show. Therefor I never use apertures below f/8. What is your experience ? I found that on all focal lengths. The test shots of architecture with A7R in full resolution processed with LR 5.3 and for comparison some of the f/4 in full res ooc JPEG without any further processing are in my flickr, see below. You will notice, that the pincushion distortions of the house are very!! poor The ooc JPEG shows perfect corrected lines and the images are a bit smaller than the RAW images due to the correction in the firm ware of the camera. There is (I did not find any) no profile for the lens in LR 5.3 or camera raw 8.3 jet. And I did some OSS test, that show pretty good results down to 1/6 sec. Of course these images show only my personal results and will vary to other users. I have images to test the distortion on my SD card an plan to upload the today. Hi Dierk, Some of the worlds top photographers make a living at f/16. As with all these pundits, educators & experts — ask to see their books (work) before paying for their advice. This is a good real world conclusion Phillip is presenting! if you like, you could try a profile I generated with the Adobe LCP software for the SEL2470Z. Maybe it’s not perfect but it works quilte good. Thanks Phillip for the interesting review and Simon for the great profile! Works very well, also with the A7R. Does anybody have a specific A7R version of the profile? Do you think that there would be a massive difference (as far as a profile is concerned I mean)? I think the profile isn’t camera specific, but I might be wrong. Distortion certainly won’t depend on the camera, there might be a small variation in vignetting but nothing you would notice under normal circumstances. Can you use this profile in camera RAW ? If so, do you know how to load it using MAC version? 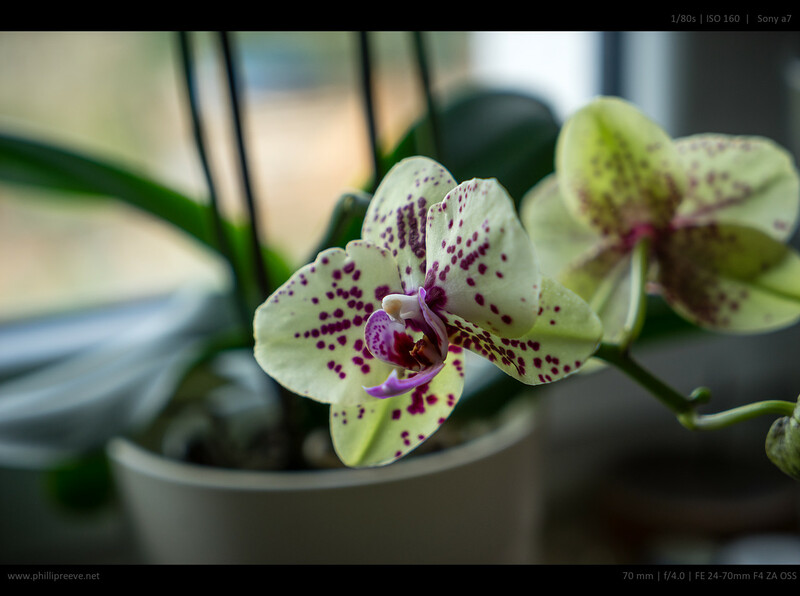 The new DNG-Converter (8.4 RC) has a native lens profile that work a bit better then this home made file. You can normally copy it the the needed folder. I am very interested in your Profile for the 24-70. I would use it with Lightroom in Raw. Can I download it somewhere? thanks very much for these interesting infos! I tried to understand Tim, but the main info is, that I don’t have to stick below f/11 any more and get more freedom in DOF – and need my tripod more often. I am looking forward for the results of your diffraction tests. and thanks, Chris, I found so many great images on rankin. You have to restart Lightroom. Some of the most famous photographers of the 20th Century nearly always shot at Aperture F11 or smaller (See Ansel Adams, Group F/64 etc), for Landscape & Macro F11-F22 are very useful. Not claiming this is the case, but I bought the bigger f/2.8 brother shortly after its release, and the performance was so similar to your findings Philip. Three years later I bought another copy (having sold the 1st one) and the difference was amazing. The performance was as good as my ZA primes at all FL, especially the weaker 24 and 70. I think Zeiss silently improves/fine tunes the designs especially if they are rushed into production to meet deadlines, but that’s just speculation from my part. nice real-world review. It seems this lens somehow inherited the character of the big ZA24-70f2.8. I use that monster since a couple of years on my A900, and I now start using it on my new A7r (with LA-EA3 adapter). The ZA lens was often criticized for its bad corners at 24mm and a quite weak performance at 70mm. Well, it is true that the corners at 24mm are really bad wide open. They become better when stopping down, but even at f11 they are still far away from being perfect. BUT… what pixel-peepers tend to forget is one simple fact: at 24mm this lens is really sharp on ~90% of the image (except the outer corners) even wide open. From 30-60mm the lens is just awesome, as the first shots with the 36MP of the A7r confirm. 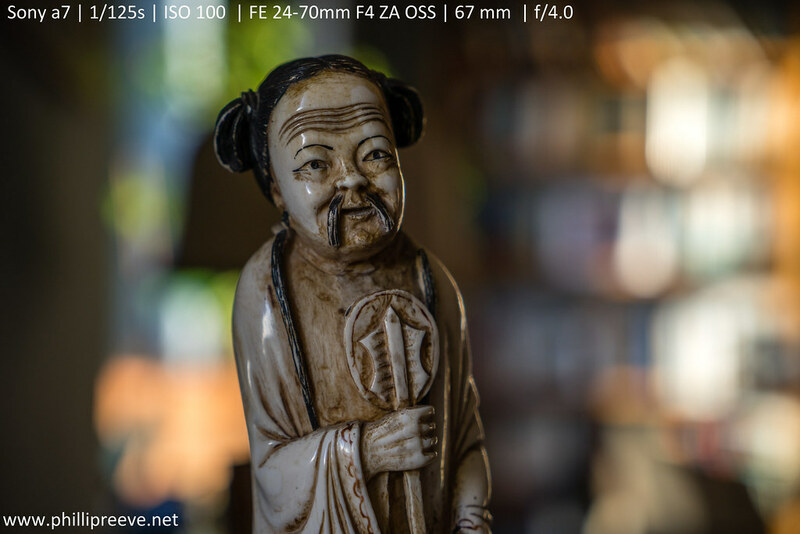 At 70mm it is ok at f8-11, but not perfect…. Just a bit like what you found about the FE version. So if the e-mount zoom is comparable to the a-mount lens at f8-13 (the typical landscape setting:-) I could really live with it, since it is half as heavy as the ZA. A side-by-side comparison would be nice. Thank you for taking the time and trouble with this report. I am disappointed that the lens I have been waiting for is not as stellar as I had hoped. There does not seem to be a really good wide option (native mount) for the A7R as yet which otherwise would be a perfect landscape camera. The 35mm is so good, was hoping the 24-70 would be too and thus would have been a great walkaround lens. I see that you have (or have had) the SEL1670z too. Which one is better at the wide end, the 24-70 or the 16-70? I shoot shop interiors and is about to invest in new gear, I want a camera with good dynmnic range, but most important is good lenses. I shoot mostly at ISO 100 with a tripod. I interested in the A7, but the Nex-7 (or A6000), a zoom, uw-zoom and a prime would be quite a bit cheaper than the A7 plus lenses. Most important though is image quality. It is always hard to compare two lenses without actually testing them against each other, but I would say that they are pretty similar, really sharp in the center and not very good in the corners. The A7 surely has a nicer sensor, but there is now wide-angle lens available yet and lenses are more expensive. and the SEL1018 is quite good so I would probably choose the a6000 in your situation. I know your discussion was taken place about a year ago, but thanks for the resourceful review on the SEL2470Z FE. But I wonder what if the same lens, using on the APS-C A6000? Same outcomes in general besides the crop factor? I honestly don’t know. 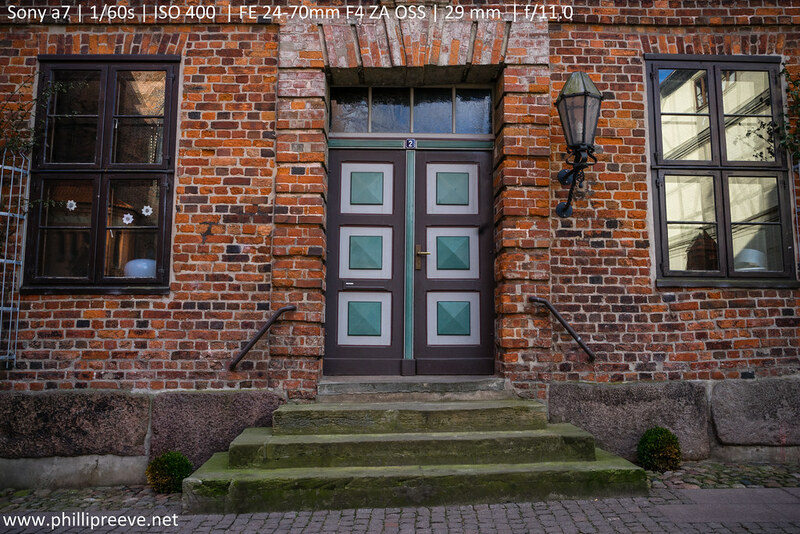 I would expect better but not great corners at 24mm and sharpness at 70mm will be reduced. But I sold my copy after this review. I was wondering, could edge sharpness depend on OSS? I shot extensively this weekend with the lens with OSS always on and sometimes I get perfectly sharp pictures, other times very bad edges (in similar situations, when I know that the edge is in the same focal plane as the centre, etc). I wonder whether edge sharpness increases (and is more consistent with OSS off), any thoughts/tests on this? 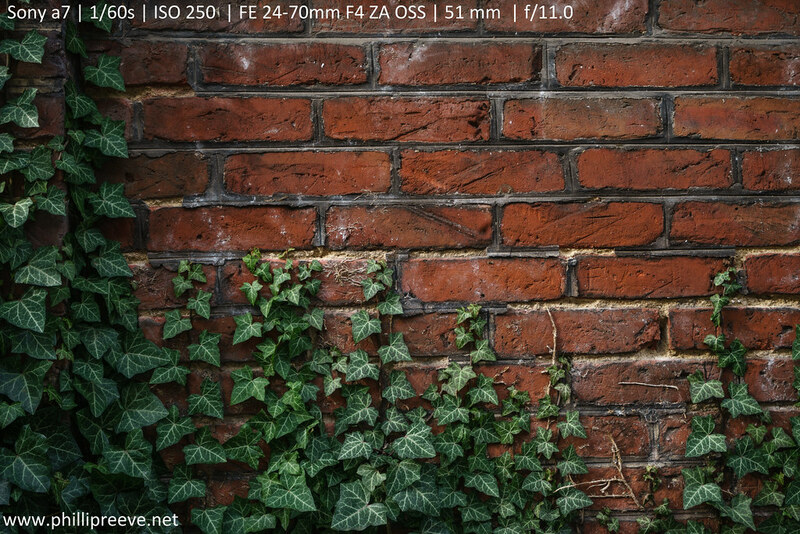 Apparently the A7 kit has rather good edge sharpness with OSS off, maybe also the FE 2470? Good light all the time! Thanks Simon, indeed that’s what I observed too. I am looking now at the raws from a short trip (150+) all shot with the 2470 all with OSS on, a part from a couple on the tripod. These have good corner sharpness. When OSS was on sometimes edges are unacceptably smudged, sometimes they are just perfect. (looking only at pictures where edge/corners should be more or less on the same focal plane). I suspect the main problem is that I focus and recompose, and I shoot before OSS stabilises again. Once the weather is better I will go out for an ‘OSS off’ trip and see if corner/edges have more consistent sharpness! Thanks, excellent review, very helpful, much appreciated! Hi Philip. Useful real world review. Thank you. Have you done a comparison with the Minolta MD 35-70/3.5 macro which I believe you own? Clearly the FE has a greater range and is AF but it would be interesting to see how these two compare in optical quality over the 35-70 range. the Minolta has sharper corners, especially at 70mm. Thanks to Phillip for the excellent work on his review. I pre-ordered the 24-70 and was really looking forward to working with it. However, it proved to be a monumental disappointment, mainly for the reasons already mentioned. Ultimately I felt that this lens was too much of a compromise: steep price tag, mediocre performance, slow (as in f4), construction (I was hoping for focus and zoom to be a purely internal affair) and build (not sure how much was metal and how much just high quality plastic. So I opted for returning the lens to Sony. I guess I’d rather spend my dollars on quality glass that will far outlast the body of the a7R. I agree with the result. As i test the lens with A7R at camera shop edge of the frame at 24mm never get sharp enough even when stop down. I hope 16-35/4 (not release yet) would not have this problem. In this discussion I miss experiences and a judgment about the 28-70 kit lens. My experience is that Sony made this time a very good kitlens with an impressive sharpness. I would like to compare them directly but my resources are limited so I can#t afford to buy a kit lens right now. Dear Phillip, I understand. 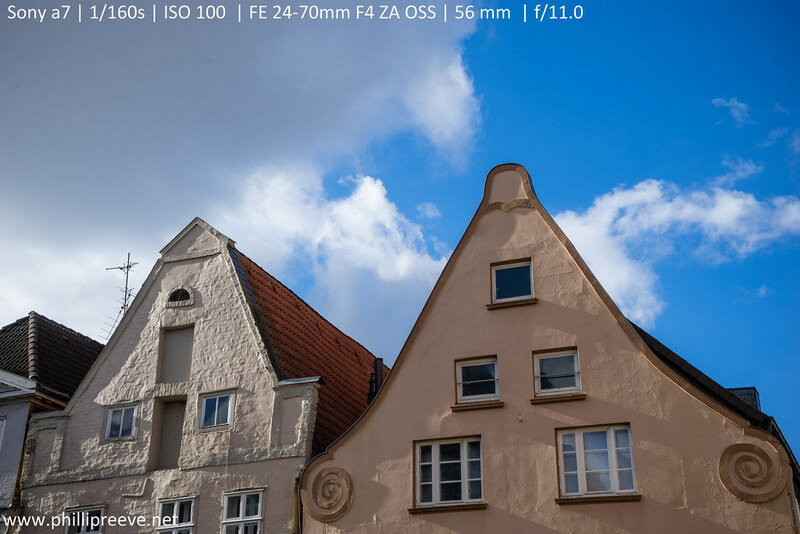 You should lend a kit lens to compare the SEL2870 and the SEL2470Z. Maybe there are other people with experience with the kitlens. I hope so. At the moment I am doubting whether an extra investment of € 1200 for the SEL2470Z is useful to replace the kitlens. great review philips!! i really like this lens and i tend to buy this lens, but i had the big brother zeiss ZA 24-70mm/2.8 so i hold it..
i really curious, can you compare it CZ FE 24-70mm f4 vs CZ ZA 24-70mm f2.8? which lens good in optical perform? This is an excellent, most useful and objective review. It must have been a lot of work to put all this information together. Thank you! I received the zoom last Friday. I was so disappointed. It was soft overall, and the left side and corners are 25-30% softer than the right side. My friend and I concluded that the max resolving power of the zoom is around 12 to 15 M-pixels. Today, it was confirmed by DX0Mark. Stick with the primes. Otherwise you’ll waste half of the A7r 36MP resolution. 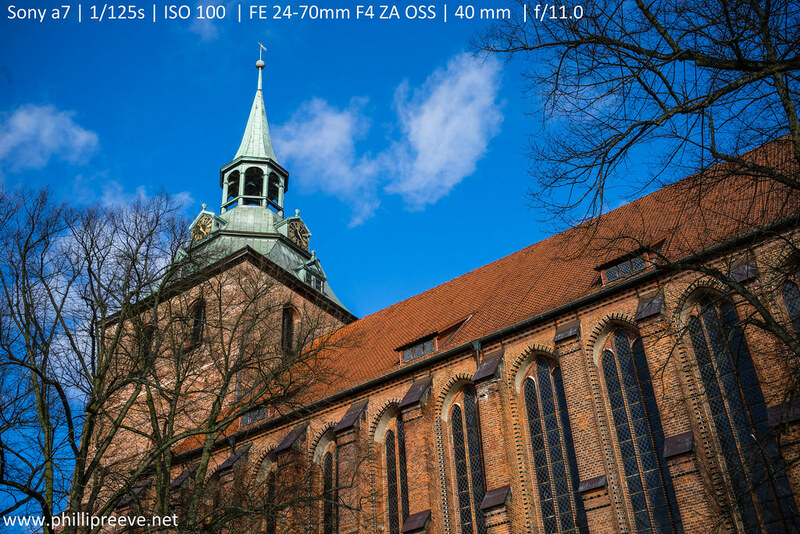 To be fair, the Zeiss 24-70mm f4 is about as good as the Canon 24-70mm f4 (peak 16MP), according to DXOMark tests. But sharpness is only one aspect of the lens. Owners of Sony A7 series who don’t want to deal with hassle of swapping lenses and want to have the signature Zeiss color, then it’s the only choice. For users who decided to keep the zoom, shoot at 15MP, so you don’t have to deal with larger files of 36MP for no obvious advantages. I think you misunderstand DXO Marks Rating, the lens clearly outresolves even a 36MP sensor in the center of the image. Hi Phillip, is your review still rolling? Or do you not own the lens annymore? I sold it, if I find the time next week I will add some thoughts and call it a review. By the way, Leica is publishing also only the “theorethical”, and not the realistic and practical MTF measurements either! For the price of the SEL-2470Z, you can’t have it all, i meant, nobody expected prime lens quality, do they?! especially for a zeiss lens. a very good lens, considering the very low price. 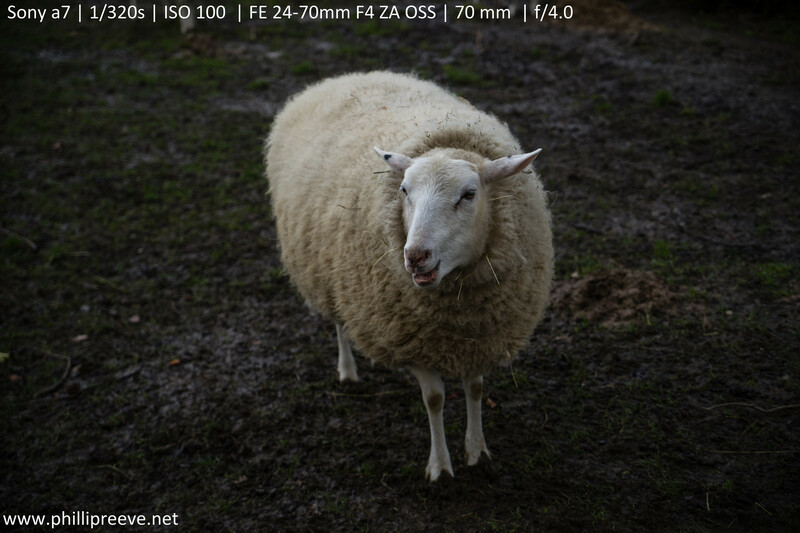 Has anyone find out how to turn off this type of manual focus on the 24-70 f4 oss? 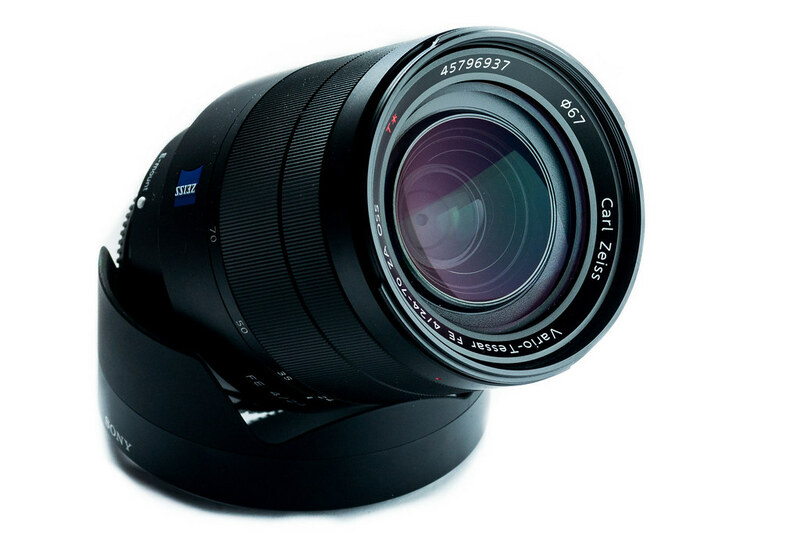 I really dont understand why Zeiss make something like this! yes it is horrible to shoot videos with this lens, a true pain for me too ! I bought this lens last week. Sorry to say that I’m not completely satisfied considering the price in relation to image quality. Works as a photojournalist so perhaps it´s still the right solution for me. Is heading out on a job now and will be interesting to see the results. Stepped down to 5.6 gives good sharpness, but with 4.0 it´s only average. Every lens is an combination of many optical faults! Zoom glasses are therefore much more susceptible to these optical faults. Most people prefer today the practical zoom lenses, but must be knowing, that they are entering into compromizes also. For excellent optical results, a single high class SWA lens will be visible better, and much more expensive. The question is how severe are the faults of the competition? In this case I fear the ansewar is: less severe and tehrefore this lens is overpriced. I just discovered your site and images and am looking forward to perusing them over the next few weeks. I love your work and reviews. I’m intrigued by the use of old manual lenses and am planning to explore that. Can I ask what you are using instead of this Zeiss 24 to 70? I have been using it for the last few months for almost all of my landscapes (I’m a hobbyist) and have noticed the soft corners like you’ve described. I’m curious to know what you are using instead. thx for your test! I will buy it for reportage and think it is good in combination with the A7RII. i really wanted to like this lens and was ready to get one until read your review, and i always trust your reviews..
Great review. I have had the FE 24-70 f4 for a number of years and it has just failed. The lens buzzes/vibrates and won’t find focus. On research I found that this is not uncommon for this lens and the 15-35 f4 as well and it is due to the failure of a dab of glue on the aperture assembly. The cost of repair is almost the same as buying a new lens. As a result I am pretty pee’d off about this and I am not jumping in to bus another Sony 24-70 f. I would love to hear your views on an alternative lens to this for the A7/9 series. I think the G 4/24-105 is the most obvious alternative. Not quite as small but optically better. Will you review the 24-105 G ? By all accounts it is a positive surprise but so far none of us plans to buy and review it. Pls do if the opportunity comes. Considering prices for this lens went down quite a bit, even more so used (probably due to its reputation): Do you think it’s becoming more attractive at 750EUR new and <600 EUR used. After all its now in the pricerange of a Canon 24-70/F4L. Am I tempted to get one? Nope. I would prefer the Tamron 2.8/28-75 which is a little larger but a better, more versatile lens.